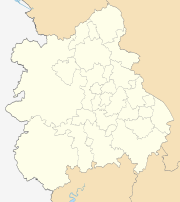 Staffordshire (/ˈstæfədʃɪər/ or /ˈstæfədʃə/; abbreviated Staffs) is a landlocked county in the West Midlands of England. It adjoins Cheshire to the north west, Derbyshire and Leicestershire to the east, Warwickshire to the south east, West Midlands and Worcestershire to the south, and Shropshire to the west. 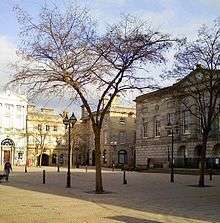 The largest city in Staffordshire is Stoke-on-Trent, which is administered separately from the rest of the county as an independent unitary authority. Lichfield also has city status, although this is a considerably smaller cathedral city. 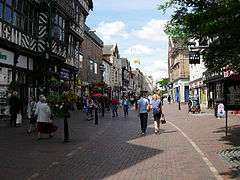 Major towns include Stafford (the county town), Burton upon Trent, Cannock, Newcastle-under-Lyme, Leek, and Tamworth. 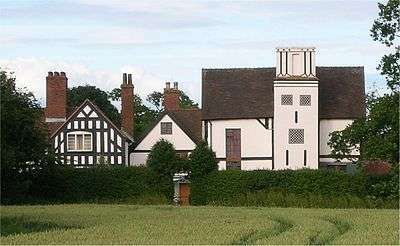 Smaller towns include Stone, Uttoxeter, and Rugeley, and large villages Eccleshall, Wombourne, Kinver, Penkridge, Tutbury and Stretton. Cannock Chase AONB is within the county as well as parts of the National Forest and the Peak District national park. 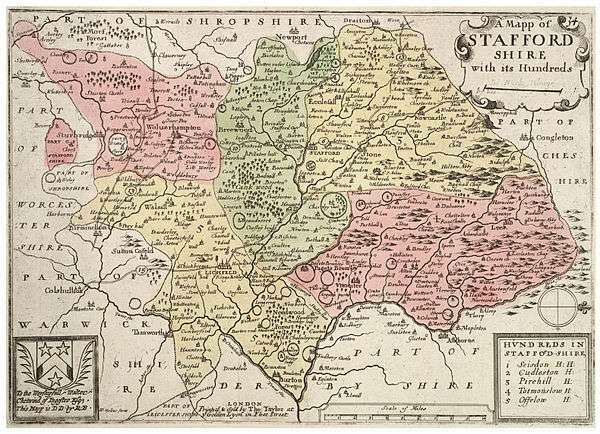 Historically, Staffordshire was divided into the five hundreds of Cuttlestone, Offlow, Pirehill, Seisdon, and Totmonslow. 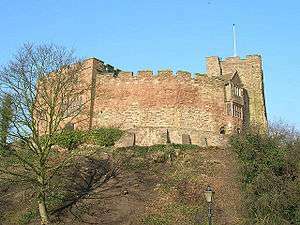 In 1553 Queen Mary made Lichfield a county separate from the rest of Staffordshire. 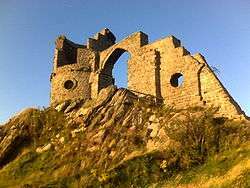 It remained so until 1888. 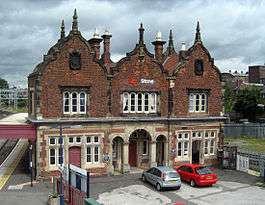 Some nationally and internationally known companies have their base in Staffordshire.They include the Britannia Building Society which is based in Leek. JCB is based in Rocester near Uttoxeter and bet365 based in Stoke-on-Trent. The theme park Alton Towers is in the Staffordshire Moorlands and several of the world's largest pottery manufacturers are based in Stoke-on-Trent. Stoke City, one of the oldest professional football clubs in existence, were founded in 1863 and played at the Victoria Ground for 119 years from 1878 until their relocation to the Britannia Stadium in 1997. They were among the 12 founder members of the Football League in 1888. By the late 1930s, they were established First Division members and boasted arguably the finest footballer in England at the time in right-winger Stanley Matthews, who had two spells with the club between 1930 and his retirement in 1965 at the age of 50. In 1972, the club finally won a major trophy when they lifted the Football League Cup, but after relegation from the First Division in 1985 they would not experience top flight football for 23 years. After spending some two decades bouncing between the second and third tiers of the English league, they finally reclaimed their top flight status in 2008 by securing promotion to the FA Premier League – where they have remained ever since. Stoke City reached their first FA Cup final in 2011, but lost to Manchester City. West Bromwich Albion, Wolverhampton Wanderers and Walsall are also notable teams from the county, from the years when those locations were inside Staffordshire. The county's other professional Football team is Burton Albion from Burton Upon Trent who currently play in the Football League Championship after back to back promotions in 2014–15 from League Two and 2015–16 from League One, after securing promotion to the Football League from the Conference for the first time in the 2008–09 season. A type of bull terrier called the Staffordshire Bull Terrier was bred for hunting purposes in this county. They are known affectionately as "staffs", "staffies", and "nanny-dogs". Staffies should not be confused with the considerably larger American Staffordshire Terrier, American Pit Bull Terrier, and (English) Bull Terrier. The only Cathedral in the county is Lichfield Cathedral in the city of Lichfield. 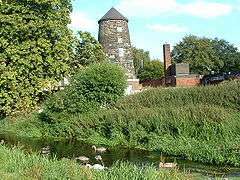 The Diocese of Lichfield covers the whole county with the exception of Stapenhill and Amington, and much of the nearby county of Shropshire and the Black Country area of the West Midlands. 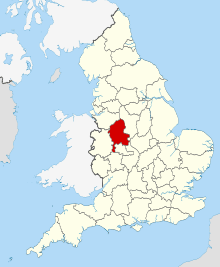 The county is covered by the archdeaconries of Stoke-on-Trent and Lichfield. The current Bishop of Lichfield is Jonathan Gledhill and the current Bishop of Stafford Geoff Annas. There are 298 Church of England Churches in the County. There are 15 mosques in Stoke-on-Trent, 5 in Burton-upon-Trent and 1 in both Stafford and Lichfield. A new mosque is under construction in the Hanley area of Stoke-on-Trent and will be the first purpose built mosque in the area. At the 2001 census there were 7,658 Muslims in Stoke-on-Trent and 6,081 in the rest of Staffordshire, with a total of 13,739 making up 1.3% of the population. 62.9% (3823) of the Muslims in the rest of Staffordshire are from the town of Burton-upon-Trent. The county has relatively good links to the national roads network. Several major roads intersect the county, making it a popular location for commuters working in Birmingham. The M42 has a junction in Tamworth at the south-east of the county, and heads south-west towards Birmingham. The M6 runs north through the county and junctions 10A-16 are in the county. The M6 Toll, the UK's first toll motorway, runs through the county with junctions in Weeford near Lichfield, Cannock and joins the M6 heading north towards Stafford. In Stafford there are three community radio stations – Windmill Broadcasting, the UK's only radio station based in a Windmill, in the Broad Eye Windmill, Stafford FM, which broadcasts to the town on 107.3 FM, and BFBS, which will start broadcasting to MoD Stafford on FM in the near future. In Cannock, there is Cannock Radio, which broadcasts online, and in Tamworth, there is TCR fm, which broadcasts locally on 106.8 FM. ↑ "Staffordshire". Collins Dictionary. 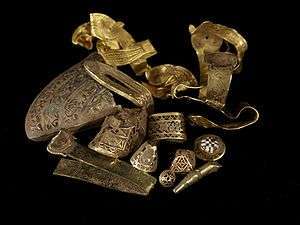 n.d. Retrieved 23 September 2014. ↑ "A History of Dudley". Localhistories.org. Retrieved 4 June 2012. ↑ Staffordshire University Website. 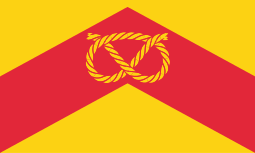 Staffs.ac.uk. Retrieved 25 August 2011. ↑ Stoke City | History | 1863–1888 in the Beginning. Stokecityfc.com. Retrieved 25 August 2011. ↑ Stoke City | History | 1930–1939 Stan's The Man. Stokecityfc.com. Retrieved 25 August 2011. ↑ Stoke City | History | 1970–1979 Waddo Believe It (Part Two). Stokecityfc.com. Retrieved 25 August 2011. ↑ Stoke City | History | 1980–1989 Five Managers, Five Chairmen. Stokecityfc.com. Retrieved 25 August 2011. ↑ Stoke City | History | 2000–2009 The Decade of Success. Stokecityfc.com. Retrieved 25 August 2011. ↑ Archive. TheFA.com. Retrieved 25 August 2011. ↑ Club | History | A Brief Club History. Port Vale. Retrieved 25 August 2011. 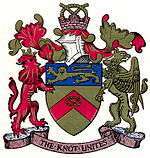 ↑ Tamworth F.C. Tamworth FC. Retrieved 24 September 2014. ↑ Stafford Rangers FC. Stafford Rangers FC. Retrieved 25 August 2011. ↑ Hednesford Town FC – Hednesford Town Football Club Latest News. Hednesfordfc.co.uk. Retrieved 25 August 2011. ↑ Wilson, Ed. (21 August 2011) Leek Town – a Charter Standard club. Pitchero.com. Retrieved 25 August 2011. ↑ Staffordshire's 1,000-Foot Peaks, Kent, Jeff, Witan Books, 2013, ISBN 978-0-9927505-0-3. ↑ Enjoy Staffordshire. Accessed 7th December 2015. ↑ "Ethnicity in Staffordshire". ONS. Retrieved 22 April 2012. ↑ "Country of Birth Staffordshire". ONS. Retrieved 22 April 2012. ↑ "Role of County Council". Staffordshire County Council. Retrieved 5 May 2010. ↑ "Role of the Cabinet". Staffordshire County Council. Retrieved 5 May 2010. ↑ Sailsman, Zoe (2002). "Bringing in the sheep – Hugh Bourne, the religious reformer from Stoke". BBC Stoke & Staffordshire. British Broadcasting Corporation. Retrieved 20 May 2007. ↑ "BBC News-Birch Terrace synagogue deconsecration ceremony". BBC. Retrieved 4 June 2012. ↑ Neighbourhood Statistics. "Religion in Staffordshire". Neighbourhood.statistics.gov.uk. Retrieved 4 June 2012. ↑ Neighbourhood Statistics. "Religion in Stoke-on-Trent". Neighbourhood.statistics.gov.uk. Retrieved 4 June 2012. ↑ "Mosques in the United Kingdom". Mosques.muslimsinbritain.org. Retrieved 4 June 2012. ↑ Muslim, British (30 January 2009). "Mosque community centre plan unveiled". Thisisstaffordshire.co.uk. Retrieved 4 June 2012. ↑ "Four arrests over Stoke-on-Trent mosque arson". BBC. 3 December 2010. Retrieved 4 June 2012. ↑ "Stolen pipe used in Stoke-on-Trent mosque arson". BBC. 23 December 2010. Retrieved 4 June 2012. ↑ Neighbourhood Statistics. "Horninglow Religion". Neighbourhood.statistics.gov.uk. Retrieved 4 June 2012. ↑ Neighbourhood Statistics. "Eton Park Religion". Neighbourhood.statistics.gov.uk. Retrieved 4 June 2012. ↑ Neighbourhood Statistics. "Burton Religion". Neighbourhood.statistics.gov.uk. Retrieved 4 June 2012. ↑ Neighbourhood Statistics. "Winshill Religion". Neighbourhood.statistics.gov.uk. Retrieved 4 June 2012. ↑ Neighbourhood Statistics. "Brizlincote Religion". Neighbourhood.statistics.gov.uk. Retrieved 4 June 2012. ↑ Neighbourhood Statistics. "Stapenhill Religion". Neighbourhood.statistics.gov.uk. Retrieved 4 June 2012. ↑ Neighbourhood Statistics. "Anglesey Religion". Neighbourhood.statistics.gov.uk. Retrieved 4 June 2012. ↑ Neighbourhood Statistics. "Shobnall Religion". Neighbourhood.statistics.gov.uk. Retrieved 4 June 2012.